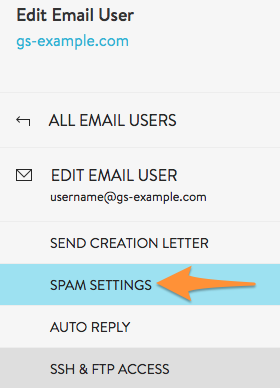 The following guide will show you how to mange the spam filter settings for your Grid. 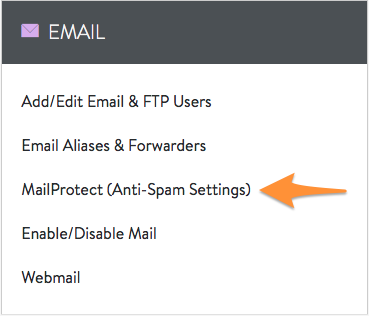 Click on MailProtect (Anti-Spam Settings). Move spam into IMAP subfolder - This is useful if you use webmail or the IMAP protocol to check your mail. 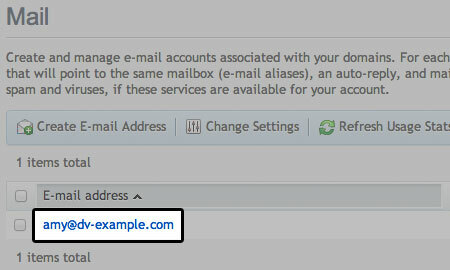 This will move any spam mail to a spam folder in your IMAP account. You may need to subscribe to the spam folder before you can see it. Check with your email client software documentation. Add tag to the spam's subject - This is useful if you are going to check your mail with a third-party email client on your desktop. You can use the rules available in your mail client to perform various actions like moving the messages to a folder, deleting them, flagging them, and so on. Delete the spam - The message will be deleted from the server entirely. You would not be able to retrieve any emails that were deleted permanently using this method. Do nothing - MailProtect will still scan the emails and apply a spam score in the mail headers themselves, but will not modify or move any messages. This is useful if you would rather have a client-side program to filter your messages based off the spam score provided in the headers. Rules set by entries in the Allow/Block list are still honored. Please choose a spam level between 1 and 10 (Default is 5). The Allow and Block lists for mail protect are compared against Envelope-From, also know as the Return-Path header. These Return-Path Headers are not always the same as the standard From header. For information on how to find the Return-Path Headers please read: Understanding a Email Header. 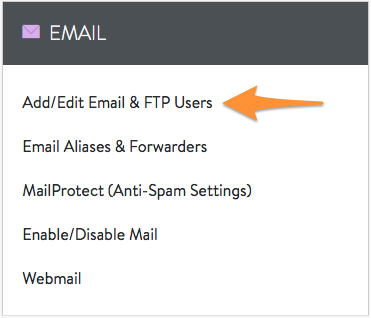 Click on Add/Edit Email & FTP Users in the EMAIL section. Click on the edit button for the user. Global Settings: Sets user to use the global settings which you configured as above. Use Custom Settings: Allows you to set custom settings only applied to the user. Disable Spam Scanning: Allows you to disable MailProtect for the user. Click Update User to save your settings. An email user can also login and change these settings from uControl. You may select to use Global Site Settings (this is determined by your domain's administrator within the Account Center), Custom Settings, or Disable spam filtering. This is available when you select Custom Settings. Select the sensitivity for classifying messages as Spam. A lower score will be more aggressive for marking spam. This is available when you select Custom Settings. Make your selection from the options: Mark as Spam (default), Move to Spam folder, or Purge Message. This is available when you select Custom Settings. Specify a list of email addresses and domains to whitelist. Each entry must be on its own line. Any email or domain that matches will automatically be flagged as trusted without being classified as Spam. This is available when you select Custom Settings. Specify a list of email addresses and domains to blacklist. Each entry must be on its own line. Any email or domain that matches will automatically be classified as Spam. How can I verify that MailProtect is working? The subject is not important. This email should always be labeled as spam unless the sender is in the "Allow List". 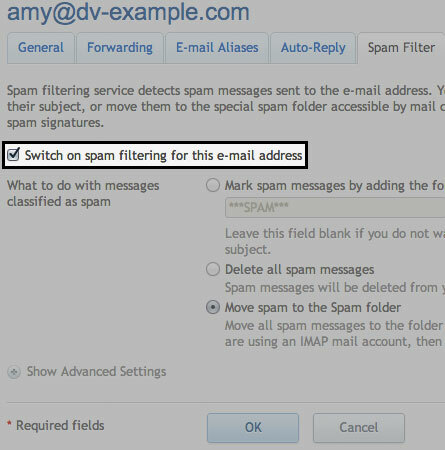 Set up your spam filter to reduce the amount of spam in your inbox. Check the box to switch on the spam filter. You can now click OK, and spam will be enabled with default settings. You're done! Your spam filter is now enabled. For detailed instructions on how to block or allow a specific email address, please see: How can I block specific incoming emails? Once spam filtering is enabled, you can improve its accuracy by manually moving spam messages into the Spam folder. This MUST be the spam folder on the server - either the one in webmail or an IMAP Spam folder in your local email client.